HomeDoes Stephen Miller Really Want To Take On Emma Lazarus? Stephen Miller, the white nationalist aide to President Trump took on a somewhat strange new enemy yesterday: Emma Lazarus. Lazarus, a relative of the United States’s first Jewish settler, wrote the poem “The New Colossus” to raise funds for the base of the Statue of Liberty in 1883. That poem, most famous for the lines “Give me your tired, your poor,/Your huddled masses yearning to breathe free,” was added to the statue’s base in 1903, inscribed on a bronze plaque. A drawing of Emma Lazarus. That fact became a point of contention yesterday when CNN’s Jim Acosta asked Miller about the human implications of the Trump administration’s stringent new immigration proposals. “What the president is proposing here does not sound like it’s in keeping with American tradition when it comes to immigration,” Acosta told Miller, quoting Lazarus’s poem as evidence. “I don’t want to get off into a whole thing about history here, but the Statue of Liberty is a symbol of liberty and lighting the world. It’s a symbol of American liberty lighting the world. The poem that you’re referring to, that was added later, is not actually a part of the original Statue of Liberty,” Miller retorted. As ThinkProgress’s Rebekah Entralgo pointed out, Miller’s point is one that has long been a common refrain among white nationalists, who claim that the poem’s late addition to the statue means its message is of no relevance to the statue — that is, when they’re not weaving anti-Semitic conspiracy theories about it. Swenson also pointed out that Lazarus’s name frequently pops up on the white nationalist website Stormfront, citing a post titled “Give Me Your Huddled Masses — The Jewess who tried to destroy the US!” as a standard headline. We would point out that in this battle of Jew versus Jew, which white nationalists on Twitter are heralding as a Fun Sport, Lazarus has already won. Miller became relevant with the rise of a president who has the lowest approval ratings in recorded history, and as that president loses relevance, so will his pasty protegee. Lazarus, on the other hand, has shaped our national conversation for over a century. Give her your tired, your poor, and Stephen Miller’s ego for dinner, while you’re at it. 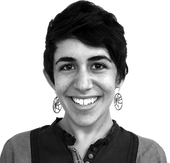 This story "Stephen Miller, Emma Lazarus Was Way Cooler Than You" was written by Talya Zax.